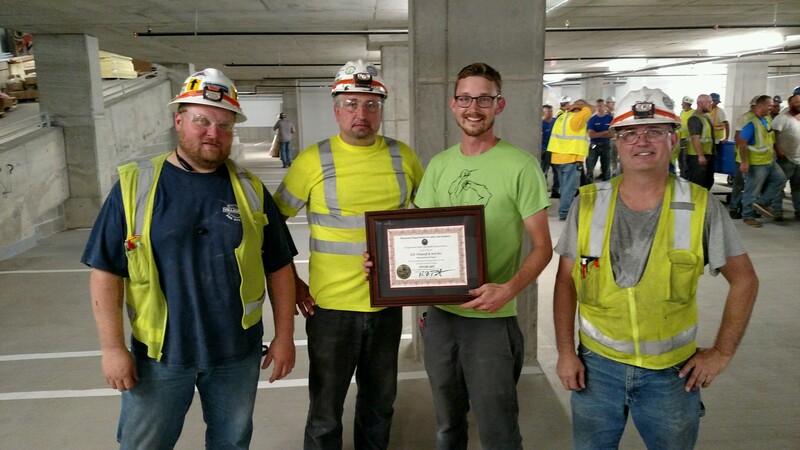 The Hub Minneapolis, a 26-story residential tower on the University of Minnesota campus, recently received recognition for becoming a MNSHARP construction worksite. The Minnesota Safety and Health Achievement Program (MNSHARP) is sponsored by the Minnesota Department of Labor and Industry’s Workplace Safety Consultation division and is awarded to projects that exceed OSHA standards. In order to become a MNSHARP worksite, the general contractor, Findorff, had to develop a strategic safety plan to proactively and effectively minimize construction-related injuries and illnesses. Between January of 2017 and May of 2018, MNSHARP representatives performed six rigorous safety inspections on the site to ensure Findorff’s safety and health management program exceeded the required standards. The designation is particularly notable because there have been fewer than 40 projects recognized as MNSHARP worksites since the program started in 2007. This is a true testament to the safety initiatives set forth by Findorff and all of the trade partners who were part of the project team. OlympiaTech is proud to partner with general contractors, like Findorff, who make safety a priority and are committed to creating a safe worksite for our crews.